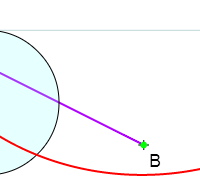 The inverted cycloid is defined by rolling a circle below a horizontal line and tracing the locus of a point on its circumference. You can see the definition by animating theta. You can make the cycloid pass through point B by changing its radius. Now press the Play button to watch the ball roll along the cycloid. Compare its speed with a ball rolling down a straight line between A and B.